Blessings – Mini Coloring Cards is a set of 12 cards placed in a nice crystal-clear zip bag. Each card provides a special blessing title, a scripture verse relating to the title and a nice picture to color. But blessed is the one who trusts in the Lord, whose confidence is in him. They will be like a tree planted by the water… Jeremiah 17-7-8. 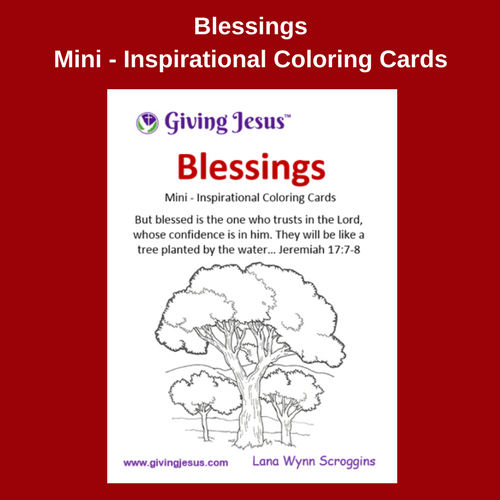 Blessings – Mini Coloring Cards is a set of 12 cards placed in a nice crystal-clear zip bag. Each card provides a special blessing title, a scripture verse relating to the title and a nice picture to color. These cards help bring encouragement and inspiration to others. The enjoyment of coloring, especially coloring for adults, is really capturing the hearts of all people.